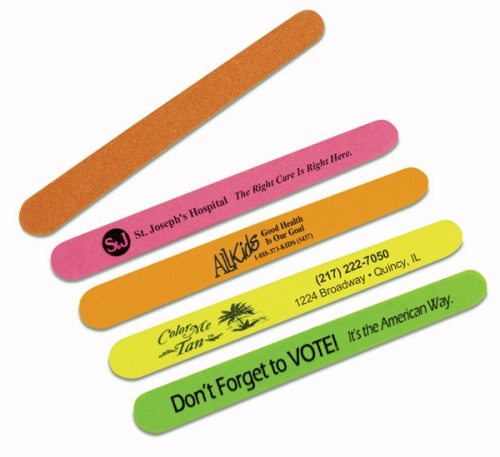 Emery Boards with custom imprint - a favorite promotional give-away! See our large selection of Emery Boards, from economically priced Natural Emery Boards to colorful Assorted Neon or Pastel Emery Boards to Bright Yellow Emery Boards. 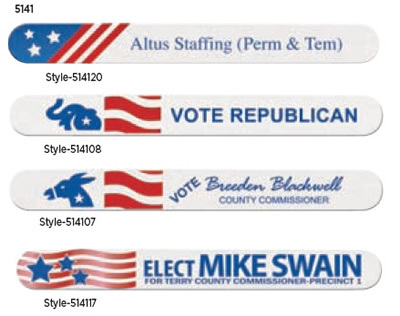 We also offer many different patriotic and political designs to promote any campaign. We offer FREE Ground shipping (within the USA) on most of our emery board products! Our natural, custom made emery boards are high quality, yet our discounted prices provide you with an inexpensive way to advertise and promote your business or campaign. 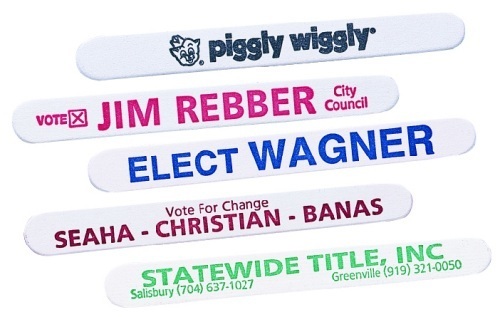 These emery board nail files are made in the USA with your personal imprinted message. Shipping and handling is free on quantities up to 12,000 pieces (ground shipping within the USA)! 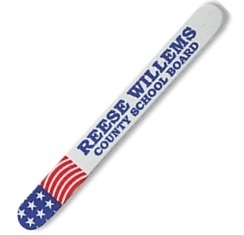 Customized Imprint Specifications: These emery boards are 4-7/8″ x 1/2″. The imprint space is 4″ wide by 3/8″ high. Print up to 3 lines of text. You may choose among six standard imprint colors: black, blue, red, burgundy, green or rhodamine red – in one color only. Most of your personal imprint colors are available for an additional charge (available on large quantity orders only). Personalized advertising at a low cost. Black ink is standard imprint color for Bright Yellow emery boards. Neon and Pastel Emery Boards come in an assortment of colors. To get all the same background neon or pastel color, add $30.00 per background color. These are 4-7/8″ x 1/2″. The imprint space is 4″ wide by 3/8″ high. Print up to 3 lines of text. Assorted Neon Emery Boards come in assorted colors of green, yellow, orange, and pink. Orders are printed with approximately the same quantity of each color. Black ink is only imprint color available. Assorted Pastel Colored Emery Boards come in personalized assorted pastel colors of blue, lavender, and pink. Orders are printed with approximately the same quantity of each color. Black ink is recommended imprint color. 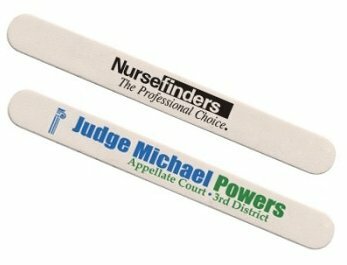 Custom Made Emery Boards – Personalized Imprint These custom emery boards are 4-1/2″ x 1/2″. The imprint space for Natural (White), Pink, or Yellow emery boards is 4″ wide by 3/8″ high. Print up to 3 lines of text. Imprint options range from 1-color to full-color. Shipping and handling is free (ground shipping within the USA)! An additional $30 non-refundable artwork charge per color is due before work can begin. An additional $50 non-refundable artwork charge is due before work can begin. Choose from Stars with Diagonal Stripes, Democrat Donkey, Republican Elephant or Stars on Wavy Stripes. Imprint area varies depending on political design with most imprint areas of 2-1/2″ wide by 3/8″ high. Print up to 3 lines of text. Check out our Custom Shape Emery Boards.